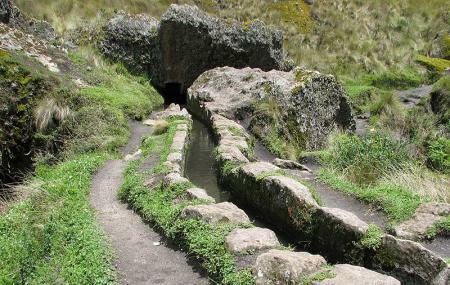 Cumbe Mayo is a fascinating archaeological site in Cajamarca, Peru. It is supposedly the oldest man-made structure in South America. Here you will find canals, dating back to at least 3,000 years, thought to be built for slowing down and regulating the flow of water. A prime attraction in the complex of canals is the Aqueduct - a canal that is 9 km long, constructed to direct water from the hills to vegetation fields and a large reservoir. Here you will also come across numerous petroglyphs and massive volcanic pillars. The volcanic pillars are truly a wonder of nature and make for a spectacular sight to behold. A visit to this site provides you a perfect opportunity of a good hike. It is worth visiting Cumbe Mayo if you are vacationing in Cajamarca. Explore Cumbemayo and other prime spots of the city using Cajamarca trip planner. You can add cozy hotels in Cajamarca like Kjacho's Inn, Hotel Cajamarca Sac - Local 01, Yuraq Hotel and Casa Bonita. Explore the best Cajamarca vacation packages that will take to you important landmarks of the city! For getting in, check out how to reach Cajamarca. Love this? Explore the entire list of places to visit in Cajamarca before you plan your trip. Fancy a good night's sleep after a tiring day? Check out where to stay in Cajamarca and book an accommodation of your choice. People normally club together Mirador Bellavista and Hacienda La Collpa while planning their visit to Cumbemayo. Fantastic easy walk for an hour or two. Stone carvings, beautiful rock formations and the incredible aquaducts. Picturesque view and interesting site to visit. It takes a bit of walking and air is more rare than in Cajamarca due to the altitude. This place is protected by the guard by the sacrifice stone. Entrance is 8 soles but we took this as a tour and that included also the guide who explained about the rivers and hieroglyphs in the stones. Nice archeological site. Would be better with informational signage or museum.